Those who have been opposed to Nairobi Senator Mike Mbuvi Sonko’s hair cut with messages have now come to believe that indeed they were wrong in one way or the other. 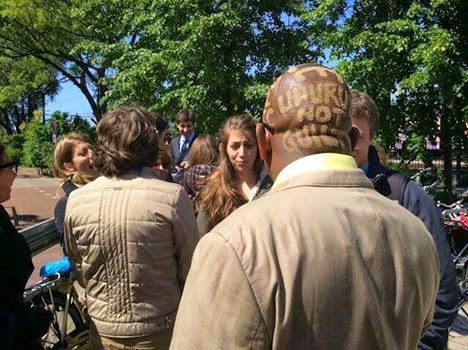 Sonko who is President Uhuru Kenyatta’s buddy pulled the first surprise when he had a hair cut style when accompanying Uhuru to the Hague which reads “UHURU NOT GUILTY”. Many dismissed the hair style and Sonko being the controversial politician he is believe to be and being an independent-minded leader who believes in God and himself has never been bothered about those criticizing his hair style but has always insisted that just like companies and organizations uses T-Shirts to advertise their products and to pass important information, he also chose to use his hair cut style to pass information. 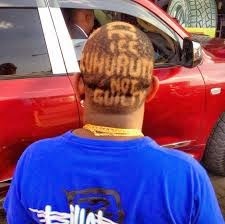 Today, Sonko boasts of having a hair cut that has now come to pass “UHURU NOT GUILTY”. But it is not only Uhuru that he has supported over the ICC cases. He had also once accompanied Deputy President William Ruto to The Hague and he had a hair cut which read “UHURUTO NOT GUILTY”. 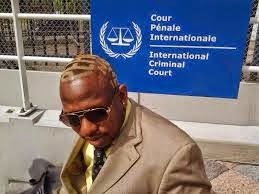 It is important to note that Sonko does not use his hair cut for political matters only. 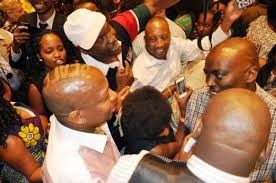 In 2013 after the presidential election results were announced and Cord went to court to challenege Uhuru’s victory, as tension continued to build, Sonko pulled a first one and had a baby mohawk with the word “PEACE” emblazoned in the middle. It not only created a buzz in the country, but also, according to Sonko, it showed his patriotism and call for peace in the 2013 election. During the campaigns for his senatorial race, he also had a hair style cut with word “PEACE” which he used to appeal to Kenyans to hold a peaceful election. He therefore campaigned on the platform of peace. During the Shujaa Day celebrations, Sonko had his hair styled with the words “SHUJAA” in the To Sonko, the inscription was a way to celebrate the heroes that have contributed to Kenya's development. Again during the New Year celebrations, Sonko had his signature “PEACE” mohawk but enhanced the look with additional message, “GOD BLESS KENYA”, wishing Kenyans a happy New Year. Love him or hate him, Sonko has maintained that he is the darling of the Nairobians and by extension Kenyans. His political clout cuts across the ethnic, tribal and religious boarders. But one thing that he has kept his supporters guessing is whether it is true he is laying grounds to contest the Nairobi Gubernatorial elections in 2017. Now that he must have a new hair cut based on the new development on ICC and now that his buddy Uhuru is a free man, Kenyans are waiting to see what message he will have for them. Will it be “Thank you Bensouda” or “Set Ruto free”, or “Ruto not guilty” or “terminate Ruto case”? Your guess could be as good as mine and only time will tell.